SYNOPSIS: This is a story of boy meets girl, begins the wry, probing narrator of 500 DAYS OF SUMMER, and with that the film takes off at breakneck speed into a funny, true-to-life and unique dissection of the unruly and unpredictable year-and-a-half of one young man’s no-holds-barred love affair. Tom, the boy, still believes, even in this cynical modern world, in the notion of a transforming, cosmically destined, lightning-strikes-once kind of love. Summer, the girl, doesn’t. Not at all. But that doesn’t stop Tom from going after her, again and again, like a modern Don Quixote, with all his might and courage. Suddenly, Tom is in love not just with a lovely, witty, intelligent woman – not that he minds any of that -- but with the very idea of Summer, the very idea of a love that still has the power to shock the heart and stop the world. REVIEW: Tom: What happens when you fall in love? Summer is the favorite season for many. 500 days of summer could be a great thing. 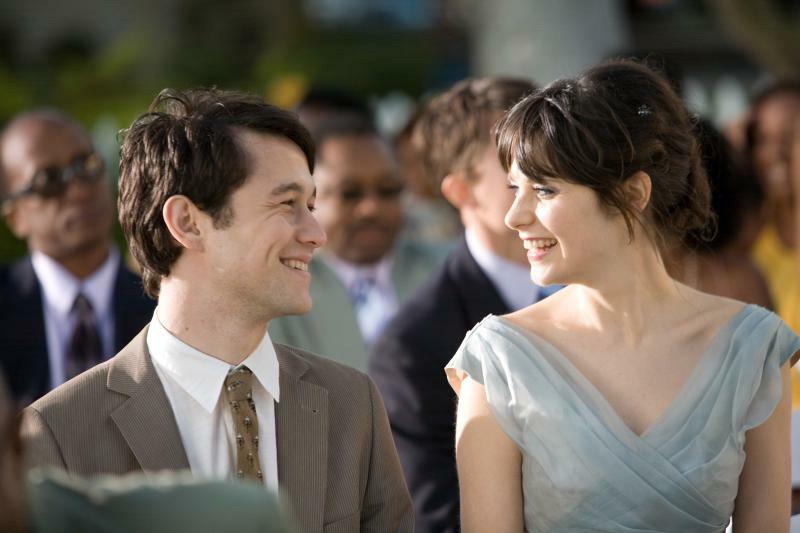 500 days of Summer (Zooey Deschanel) could be a good thing or a bad thing; and there in lies the unfolding of this tale. “Love doesn’t exist, it’s a fantasy.” That’s the kind of philosophy that Summer lives by. Pretty sad if you ask me. Tom (Joseph Gordon-Levitt) on the other hand is the hopeless romantic under the influence of the Summer effect. As the opening narration states, this is not a love story, it’s more of a battle between this hopeless romantic and the non-emotional realist. It’s a boy meets girl but not so cliché. As one of Tom’s buddies, McKenzie (Geoffrey Arend), declares “you’re a dude . . . she’s a dude”. The typical male/female positions regarding relationships seem to be reversed in this circumstance. The whole movie is random for that matter. It scans the 500 days in random, non-sequential order. The emotions expressed are just as variable. There is depression, heartache, pain, and coldness but there is also love, devotion, and wonder. This film is visually stimulating with good camera use, appropriate sets, nice architecture, and of course, Zooey’s big beautiful blues . . . and she can sing too! Heck, the entire soundtrack is pretty good. From the opening narrative you can tell that you are in for a treat. This is not your typical romantic comedy. Actually, the opening narrative lays it all out for you quite nicely so you are off to a good start. You’ve heard of the cycle of life, well this is a good representation of the cycle of love. Relationships form, relationships break, some are recycled, and some may have never existed in the first place. The tale this movie tells is pretty smart and down-to-earth realistic. A good part of what makes it that way is the sharp, modern script. It also helps when you have a Zooey Deschanel delivering some of that script. She always adds a little more spice to her lines and her characters. Oh Zooey, Zooey, Zooey, you are a special one. Joseph also shines with his role and he really looks the part. Another interesting character is Rachel, Tom’s much younger sister played by Chloe Moretz. Her advice to her brother is practical and wise way beyond her years which is the source of a few extremely amusing scenes. Some other incredibly amusing scenes in this film are some moments in an IKEA store as well as a dance number. Yeah, you’ve got to see it to believe it. The performances by these actors fit the movie well. They were laid back and very natural which made it look more realistic. I applaud Director Marc Webb, not only because I like his first name and the way he spells it, but also because he did a wonderful job with this his first major motion picture direction. I really don’t think you’ll be disappointed if you choose to watch this one, but heed the warnings given by the opening narrative.